We have added a second installation option for our Johnny Smith style humbucker pickups. They are now available in a pickguard style mount, in addition to our standard version with the wrap-around style U-shaped bracket. Lollar Johnny Smith style pickup - now available in a pickguard mount. As the name suggests, the pickguard style mount attaches to the pickguard via the straight tab that protrudes from the underside of the pickup. 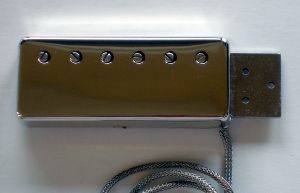 The straight tab is an extension of the Johnny Smith style pickup's base plate. You can see in this photo that the tab itself is an extension of the pickup’s base plate. As a result, it provides for a very solid attachment to the guitar. This new installation type is available in both cover styles – nickel and gold. 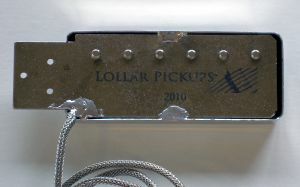 For even more details, including sound clips, follow this link to our Lollar Humbucker Pickups page. Once you’re there, scroll down toward the bottom for additional information on the Lollar Johnny Smith style humbucker. The new pickguard mount Lollar Johnny Smith style humbucker will be available for on-line purchase within a few weeks. In the meantime, feel free to call us at (206) 463-9838 to place a phone order.